December 20, 2012 - NASA completed the latest in a series of parachute tests for its Orion spacecraft Thursday at the U.S. Army Yuma Proving Ground in southwestern Arizona, marking another step toward a first flight test in 2014. 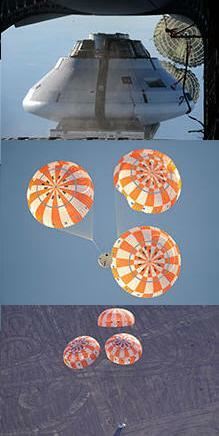 The test verified Orion can land safely even if one of its two drogue parachutes does not open during descent. The "Orion" Multi-Purpose Crew Vehicle (MPCV) is a planned beyond low earth orbit manned spacecraft that is being built by Lockheed Martin for NASA based on designs and tests already completed as part of the now-cancelled Constellation program, development for which began in 2005 as the Crew Exploration Vehicle. The MPCV was announced by NASA on 24 May 2011. The MPCV's debut unmanned multi-hour test flight, known as Exploration Flight Test 1 (EFT-1), is scheduled for a launch aboard a Delta IV Heavy rocket in 2014. The first manned mission is expected to take place after 2020. To verify Orion could land safely with only one drogue parachute, engineers dropped a spacecraft mockup from a plane 25,000 feet above the Arizona desert and simulated a failure of one of the drogues. About 30 seconds into the mockup's fall, the second drogue parachute opened and slowed the mockup down enough for the three main parachutes to take over the descent. The next Orion parachute test is scheduled for February and will simulate a failure of one of the three main parachutes. In 2014, an uncrewed Orion spacecraft will launch from Cape Canaveral Air Force Station in Florida on Exploration Flight Test-1. The spacecraft will travel 3,600 miles above Earth's surface. This is 15 times farther than the International Space Station's orbit and farther than any spacecraft designed to carry humans has gone in more than 40 years. The main flight objective is to test Orion's heat shield performance at speeds generated during a return from deep space.